Take one serving (1 scoop) of C4® Original, mixed with 6 fl. oz. of water 20-30 minutes before training. During your workout, it is recommended that you drink plenty of water or performance beverage such as Cellucor Alpha Amino® to stay hydrated. THIS PRODUCT IS ONLY INTENDED FOR HEALTHY ADULTS, 18 YEARS OF AGE OR OLDER. Do not use if pregnant, nursing, currently taking PDE5 inhibitors or nitrates for chest pain. Do not take this product before consulting a licensed, qualified, health care professional if you are taking any other dietary supplement, prescription drug or over-the-counter medication; or if, you suspect you have or have been treated for, diagnosed with or have a family history of, any medical condition. This product contains caffeine and should not be used in combination with caffeine or stimulants from other sources. Discontinue use 2 weeks prior to surgery. Immediately discontinue use and contact a medical doctor if you experience any adverse reaction to this product. Do not use this product continuously for more than 8 weeks. Do not use if safety seal is broken or missing. Store in a cool, dry place. KEEP OUT OF REACH OF CHILDREN. Natural & Artificial Flavors, Polydextrose, Citric Acid, Malic Acid, Calcium Silicate, Silicon Dioxide, Beet Juice (color), Sucralose, Acesulfame Potassium TeaCor™ Tetramethyluric Acid is protected by Patents Pending, Serial No. 61/903, 362; under exclusive global distribution by Compound Solutions, Inc.
Citric Acid, Polydextrose, Natural & Artificial Flavors, Calcium Silicate, Silicon Dioxide, Sucralose, FD&C Red Lake #40, Acesulfame Potassium TeaCor™ Tetramethyluric Acid is protected by Patents Pending, Serial No. 61/903, 362; under exclusive global distribution by Compound Solutions, Inc. Artificial Flavors, Polydextrose, Citric Acid, Malic Acid, Calcium Silicate, Silicon Dioxide, Sucralose, Acesulfame Potassium, FD&C Red Lake #40 TeaCor™ Tetramethyluric Acid is protected by Patents Pending, Serial No. 61/903, 362; under exclusive global distribution by Compound Solutions, Inc.
Natural & Artificial Flavors, Polydextrose, Citric Acid, Malic Acid, Calcium Silicate, Silicon Dioxide, Sucralose, Acesulfame Potassium, FD&C Red Lake #40 TeaCor™ Tetramethyluric Acid is protected by Patents Pending, Serial No. 61/903, 362; under exclusive global distribution by Compound Solutions, Inc.
Polydextrose, Natural & Artificial Flavors, Citric Acid, Malic Acid, Calcium Silicate, Silicon Dioxide, Sucralose, Acesulfame Potassium, FD&C Blue Lake #1. TeaCor™ Tetramethyluric Acid is protected by Patents Pending, Serial No. 61/903, 362; under exclusive global distribution by Compound Solutions, Inc.
Polydextrose, Natural And Artificial Flavors, Citric Acid, Calcium Silicate, Silicon Dioxide, Malic Acid, Sucralose, Beta Carotene, Acesulfame Potassium TeaCor™ Tetramethyluric Acid is protected by Patents Pending, Serial No. 61/903, 362; under exclusive global distribution by Compound Solutions, Inc.
Malic Acid, Natural Flavors, Citric Acid, Silicon Dioxide, Sucralose, Calcium Silicate, Acesulfame Potassium, FD&C Red #40. 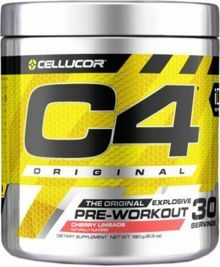 Take one serving (1 level scoop) of C4® Original, mixed with 6 fl. oz. of water, 20-30 minutes before training. THIS PRODUCT IS ONLY INTENDED FOR HEALTHY ADULTS, 18 YEARS OF AGE OR OLDER. Do not use if pregnant, nursing, currently taking PDE5 inhibitors or nitrates for chest pain. Do not take this product before consulting a licensed, qualified, health care professional if you are taking any other dietary supplement, prescription drug or over-the-counter medication; or if, you suspect you have or have been treated for, diagnosed with or have a family history of, any medical condition. This product contains caffeine and should not be used in combination with caffeine or stimulants from other sources. Discontinue use 2 weeks prior to surgery. Immediately discontinue use and contact a medical doctor if you experience any adverse reaction to this product. Do not use this product continuously for more than 8 weeks. Do not use if safety seal is broken or missing. Store in a cool, dry place. KEEP OUT OF REACH OF CHILDREN. This product is sold by weight, not volume. Some settling of powder may occur during shipping and handling, which may affect density of powder. This product contains the servings indicated when measured exactly by weight. Malic Acid, Citric Acid, Natural & Artificial Flavors, Silicon Dioxide, Calcium Silicate, Sucralose, Acesulfame Potassium, FD&C Blue #1. Natural & Artificial Flavors, Citric Acid, Silicon Dioxide, Sucralose, Acesulfame Potassium, FD&C Red #40. Natural & Artificial Flavors, Malic Acid, Sucralose, Silicon Dioxide, Acesulfame Potassium, FD&C Yellow #5, FD&C Blue #1. Citric Acid, Silicon Dioxide, Natural & Artificial Flavors, Beet Root (color), Calcium Silicate, Sucralose, Acesulfame Potassium. Citric Acid, Natural & Artificial Flavors, Silicon Dioxide, Sucralose, Beta Carotene, Acesulfame Potassium. Citric Acid, Natural & Artificial Flavors, Silicon Dioxide, Calcium Silicate, Malic Acid, Beet Juice (color), Sucralose, Polydextrose, Acesulfame Potassium. Natural & Artificial Flavors, Citric Acid, Silicon Dioxide, Malic Acid, Calcium Silicate, Sucralose, Acesulfame Potassium, FD&C Red #40. Malic Acid, Citric Acid, Silicon Dioxide, Natural & Artificial Flavors, Calcium Silicate, Sucralose, Acesulfame Potassium, FD&C Red #40. Natural & Artificial Flavors, Malic Acid, Citric Acid, Silicon Dioxide, Sucralose, Acesulfame Potassium, FD&C Red #40. Natural & Artificial Flavors, Silicon Dioxide, Citric Acid, Malic Acid, Calcium Silicate, Sucralose, Acesulfame Potassium, FD&C Blue #1. Artificial Flavors, Silicon Dioxide, Citric Acid, Malic Acid, Calcium Silicate, Polydextrose, Sucralose, Acesulfame Potassium, FD&C Red #40. Citric Acid, Malic Acid, Beet Root (color), Natural Flavors, Silicon Dioxide, Sucralose, Acesulfame Potassium. Scivation Xtend has been renamed to Xtend Original, marking the end of a very serious era! @Scivation has now moved to @Xtend on Instagram. 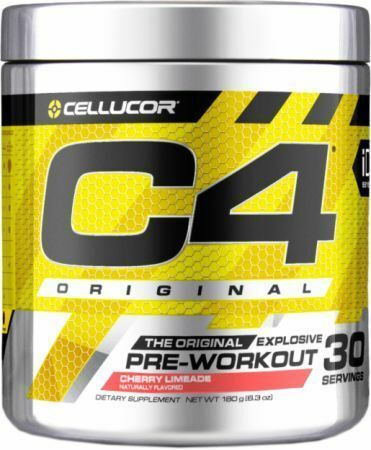 Cellucor C4 Sport has been released in late 2014 at select Wal-Mart stores. We analyze the ingredients and decide whether or not its worth it. Stay tuned to this page for an ingredient analysis - with the addition of a touch more caffeine and Theacrine (shown as TeaCor on the label), this is going to be a huge hit! On this page you can get price drop notifications as more and more stores get it and the price comes down. Icy Blue Razz This is a Buy 1 Get 1 FREE offer! Tart Candy Explosion This is a Buy 1 Get 1 FREE offer!